Starting at 72 hours out, Friday morning, until Sunday evening, 132 hours out. Finally the GFS is getting on board with the Euro for the tropical wave currently just north of Panama developing over the western Caribbean and then moving northward towards the GOM, too early to say exactly where it will track. With a very warm GOM waters and not so bad forecasted UL winds it is a good possibility of it becoming a hurricane over the GOM. Last night's Euro's ensembles showed a track anywhere from SE LA to the FL big bend area. It will all depend on where exactly the Bermuda ridge which is forecasted to strengthen will set up, the closer it sets up to FL the further west the track will be, the closer to Bermuda it sets up the closer the track of this system will track further east closer to the FL Peninsula. In case anyone is wondering the waters of the western Caribbean and most of GOM are above average for this time of the year, very warm across the central GOM. 80-86 deg F all across the GOM. To show NDG's point, this is Sunday, from last night's 00z Euro. All eyes now, will be on this afternoon's Euro run. Hopefully the 12z GFS & CMC put everyone on notice. IMO, the officials in NOLA need to work around the clock to clean the drains. Will be watching for sure. Models are trending more west towards Louisiana and waters are still quite warm. Canadian near Mouth of River, then up through MS as a near hurricane. That is a big shift west from just north of Tampa at 00z. Models are picking up on this all at the same time. EURO led the way the past few days and is shifting west, interesting 12z run coming up. Bahamas and Florida during the next couple of days. The synoptic pattern says it all. Stout mid-level ridge off the SE US, trof over the Great Plains. Everyone from Louisiana to Florida needs to watch out. 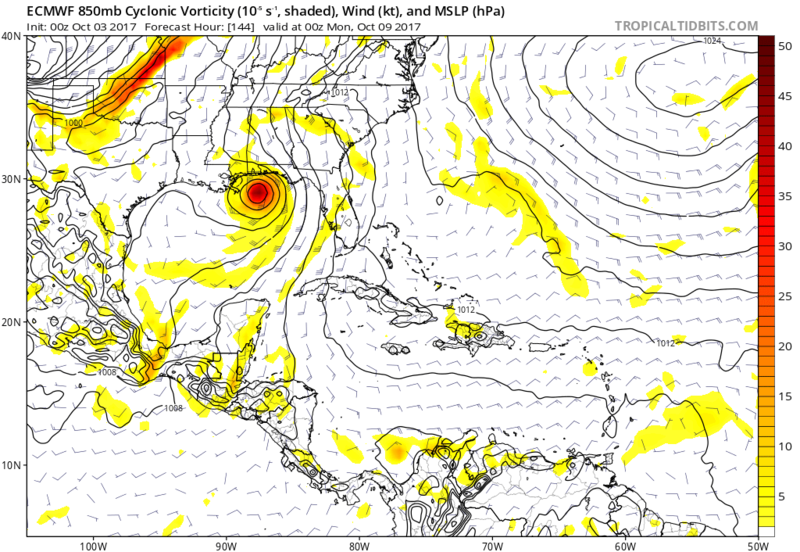 GFS/Euro suggest we could have a tropical cyclone as soon as tomorrow. Not good that the new 12z Euro develops 90L much quicker than previous runs, it could very well become a hurricane before it gets out of the Caribbean. 12z Euro path, trending the same as last night's run.